When Iraq and Afghanistan veterans, especially those who are leaders in veterans groups, appear on news stories a point they often make is that there is a disconnect between those fighting the wars and the American public. They often describe how the American public, at least those who are not directly involved in the war effort, really have no idea what these veterans experience and have to deal with. This is probably due, in part, to the fact that military service is voluntary; had there been a draft, the chasm between veterans’ experiences and Americans’ knowledge of those experiences wouldn’t be so great, as many more millions of Americans would have been directly affected by both wars. 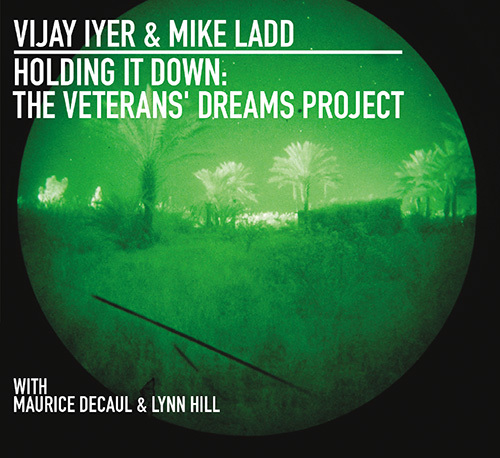 Cue the absolutely brilliant and stunning new album from Vijay Iyer & Mike Ladd, entitled Holding it Down: The Veterans’ Dreams Project, which dropped this week. In 2009 Iyer and Ladd began interviewing veterans of color about their dreams at night. Ladd took many of these dreams and turned them into poetry. Marine Corp veteran Maurice Decaul, a poet who was in Iraq in ’03, and Lynn Hill, an Air Force veteran who piloted drones, contributed their own poetry and read it on the album. The end effect, as one would expect, is chilling. Although chilling is not strong enough of a word. There is a visceral reaction; one literally feels this music and these words. These are the dreams, words and experiences of people who have killed, who have witnessed killing, who suffer long after their tours ended. As my co-host on The Turnaround radio show noted after we played “Capacity,” featuring Lynn Hill, this album hits like a ton of bricks. The track gave both of us chills as it was going out over the air. The dreams, as set to poetry here, deal with subjects one might expect: having to pull the trigger, descriptions of weapons, the sound of gun fire, being in the desert, fellow soldiers dying, etc. The personnel configuration rotates, giving the album a diverse sonic palette and range of colors and textures. Iyer is on piano, Rhodes, and electronics. Ladd, in addition to vocals, contributes synths, and Guillermo E. Brown adds vocals and effects. Guitarist Liberty Ellman and cellist Okkyung Lee augment the ensemble on several cuts. Holding it Down is a must listen, not in the terms of it’s a “must listen” in the way critics such as myself like to label an album we think is really entertaining or fun or whatever. It’s a must listen because it does what great art is supposed to do: challenge it’s reader/viewer/listener, question what they know and think, and to put them in a cognitive and/or emotional spot of bother. It’s a must listen not because it is necessarily meant to be something enjoyable to put on the stereo and chill to (although truth be told a lot of the music is straight banging – if there was one, I’d put an instrumental version of the album on repeat). Holding it Down is an album you have to kind of prepare yourself for, mentally and emotionally. Every American, especially those without ties to veterans, needs to listen to this, no matter how difficult it may be. This is not meant to be hyperbole. Given the possibility of another Middle Eastern military intervention, I think it is imperative that Americans try and come to grips as much as possible with the repercussions such an action might come with. For those with the willingness and strength to get through it, Holding it Down should help bring its listeners a little bit closer to the experiences of Iraq and Afghanistan vets.